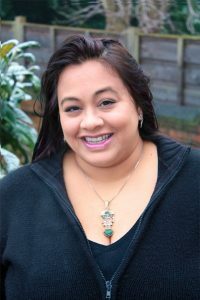 Georgina Kamsika is a speculative fiction writer born in Yorkshire, England, to Anglo-Indian immigrant parents and has spent most of her life explaining her English first name, Polish surname and Asian features. She is an active member of the Society of Authors and graduated from the Clarion West workshop in 2012, studying under a roster of instructors that included George R.R. Martin, Connie Willis and Chuck Palahniuk. She works as a first reader for the Hugo Award-winning Lightspeed Magazine. As a second-generation immigrant, her work often utilises the speculative element to examine power structures that are mirrored in the real world, touching on issues of race, class, and gender. Whenever she’s not writing, she loves reading and walking her dogs in the woods. You can find her lurking on Twitter. She’s represented by Jennie Goloboy at Donald Maass Literary Agency.